The release of the final New Vegas DLC chapter Lonesome Road brings an end to the Courier’s journey through the post apocalyptic Las Vegas wastes. With it the last chapter in the Fallout New Vegas tale. Although New Vegas DLC has normally been delayed and sometimes unfavourably reviewed, Obsidian kept their promise. Continual support for New Vegas with 4 servings of DLC available on all formats. PC gamers can continue the wander through the retro-futuristic wastelands with a number of great fan-base mods. But console gamers, this is your final call until the next Fallout game, whenever that may be. I’m a massive fan of both current-gen Fallout offerings. I would put both Fallout New Vegas and Fallout 3 in my top ten games of the last 5 years. Both are hardly distinguishable from each other and share some of the same glitches, shoddy textures and catastrophic system crashes. I love them just the way they are. True story: Fallout 3 red-ringed two of my Xboxes, the lovable scamp! The DLCs on the other hand, have followed the pattern of having one decent and three mediocre offerings per game. A poor return on the time waiting between releases and points spent on content. Although all New Vegas DLCs take the player to radical new locations, it seems every time a title and release date was made official, my hopes would peak. Maybe this time the immersion of the main game would be replicated. I could continue onwards in my joyous grind. Only for my dreams to be crushed a couple of hours later. But I would never learn. I’ve set out here to have a look back at the four expansions made available for New Vegas DLC and try to find some good in all of them. This is harder than it should be for a game so critically acclaimed! And so on to the retrospectives and reviews. New Vegas DLC chapter Dead Money is set in the forgotten casino of Sierra Madre, and sees you and three new companions searching for the legendary treasure within. The story takes a decidedly darker route than the main game, with a hazy visual filter and the menacing Ghost enemies, but loses some of the intensity with the strict linear and structured missions. Only a dozen new quests were added and were split between being long and tedious, or trap-filled and frustrating – much of the playtime will be filled with saving and reloading after trial and error. Around ten new perks are available, seven of which can be taken to the Mojave. The loot you find will probably be no better than that which you already have on your return, and you are teased with a huge amount of possible caps from gold bars as reward for finishing, but you neither have the strength to carry them all nor any realistic option to sell them. On the positive side, the best part of Dead Money is also the most important; there really is quite a captivating narrative which keeps you trawling through the claustrophobic level design. The companion side missions are far removed from the normal Fallout fare, and the characters’ story resolutions are worthwhile. Although I would have liked to have kept one or all the companions, seeing their conclusions was reward enough. It is not often you have empathy for a video game character, let alone a non-playable one. Dead money did show some real potential, and the story alone was enough for me to continue to the finish, but replacing openness in favour of linearity removed any chance of repeat play. Lessons were learnt from Fallout 3, and like all New Vegas add-ons, the level cap is raised by 5 which adds some millage, but the cost of the New Vegas DLC feels a bit like blackmail to improve your characters stats. And so a middle of the road 50% is all I can give. Honest Hearts takes another right turn from the New Vegas story line as you exit the Mojave on an outing to the preserved wilderness of Utah’s Zion National Park. Here you encounter the warring tribes; the Dead Horses, the White Legs and the Sorrows; a smattering of new characters and gear as well as finally coming face to face with the Caesar’s former top soldier, the mysterious Burned Man. Depending on how far you have progressed in New Vegas, this name will either leave you intrigued, afraid or simply confused. This New Vegas DLC opens with the standard Pip-Boy radio signal, this time from the Happy Trails Caravan Company. They are looking to reopen a trade route with Utah and are offering the opportunity to join the expedition to those wandering the wastelands. Sticking to the norm, with this DLC you cannot bring any companions with you, but you are able to bring some of your equipment. The yomp will be long though, so you are limited to 75 pounds. Choose wisely, as you’ll be fighting from about two minutes in! After the initial free-for-all, the pace takes a dive with a series of fetch quests and recon missions and offers a number of conclusions depending on whether you seek a peaceful solution or all-out tribe genocide. Zion did not feel the brunt of the war, and this is reflected in the flowing greenery and thriving wildlife (translation- plenty of crippling cazadores or yao guai encounters). The scenery is striking and does show some variance is possible on the ageing Fallout engine, but it definitely does not equal the first encounter with the scorched Capital Wasteland. Rather than skirt around it, it’s easiest to straight-out say I did not enjoy Honest Hearts and found it short on thrills but long on monotony. As well as being full of bugs, Honest Hearts played it safe, took no risks and didn’t bring anything memorable to the table. One of the new features was weather, adding rain or an overcast effect to the game, although as the change in atmosphere achieved through the murky hue of Dead Money had already been utilized, this seems hardly a groundbreaking new addition! You can return to Zion after completing the New Vegas DLC, if you so wish, but all gamerpoints can be achieved in one playthrough and I can see no need to revisit. Apart from the increase in level cap I can not see any reason to explore further than the main quests. Now we’re talking! Old World Blues is the apex of New Vegas expansions and makes a bold attempt to surpass the measuring stick of Fallout 3’s ‘Point Lookout’. As with the departure from the main game in Mothership Zeta, the player is removed far from reality to be placed inside Big Mountain, where the Courier becomes part of a sprawling lab experiment. With its large terrain to explore, plenty of missions, some bizarrely humorous NPCs and some actually useful swag to take back, this really is the the best of New Vegas DLC. From the start of the arriving at Big MT, you learn that your spine, heart and brain have all been extracted and replaced with cybernetic equivalents, you are then greeted by an arguing set of floating brains who turn out to be the remnants of a unique group of scientists. And thus the tone is set for this adventure! You retain all your previous spoils, which is a bonus as the enemies in this New Vegas DLC chapter are TOUGH, but you also get access to some of the best tools on offer within the first quarter of the 8 hour experience. The overall mission is very briefly referred to, but the overview revolves around two feuding robots, the “virtuous” Doctor Klein and “evil” Doctor Mobius. With each fetch quest, the story is expanded further, but this can be achieved in almost any order, as you are not corralled into completing and progressing in any set way. The backstories around the origins of some the mutated creatures in the Wasteland are also revealed along with encounters with hardened or legendary variants. Who would have guessed a bloatfly could be the toughest enemy in the game!? The dialogue is pitch black in humour and thick with surreal-ness. I believe this is the first time I have heard the phrase “Fully erect hand penises” in any medium. Each of the scientists has its own unique personality, not to mention the fixtures and fittings in your room: There are rivalling light switches, a mug-obsessed miniature sentry bot, a raggedy bluesman juke box, the list goes on – and all add to the charm of the expansion. Old world Blues really does reward exploration, both in the ability to retain a base in Big MT for all items collected and the ability to return at will after completion, and by continually providing excellent dialogue. There is also the opportunity to retain some of the best perks, implants and traits in the game and the ability to change from your opening level 1 loadout. The story may not be the tightest as some quests in the main game, and takes some liberties with the dreamlike setting, but it is certainly the funniest and gameplay is without rival. And so here we come full circle to the end of the New Vegas DLC experience. 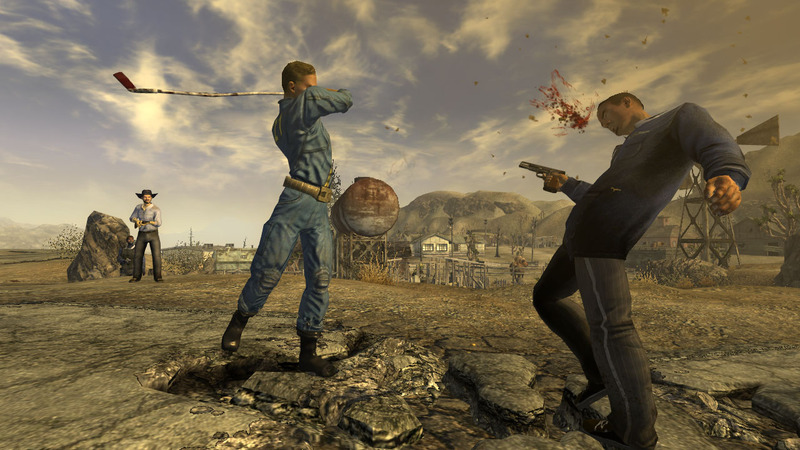 As the Couriers story began with such a literal ‘BANG’, hopefully Lonesome Road will fill in what happened not just at the end of New Vegas, but hopefully the tale before Benny’s critical introduction. Lonesome Road begins with your character contacted by the occasionally-mentioned original Courier 6, now known under the name ‘Ulysses’. You are invited to travel to The Divide, a wild new area beleaguered by earthquakes, the only humanesque inhabitants being the feral Marked Men. The title of the expansion rings true, you have to undertake this journey on your own (save for a revamped ED-E you recruit almost instantly). I won’t go into plot, as I really have no clue as to what I am supposed to have learnt. The vagueness runs around Ulysses hating the courier for deeds done before the fateful bullet in the head, but this is not properly explained. There are mentions of Caesar and the NCR, something about warheads, Ulysses seeking revenge and other fuzzy plot points. Where Dead money had interesting and individual character back stories; where Honest Hearts had a distinctly related NPC in the Burned Man and where Old World Blues had erratic but intriguing dialogue, Lonesome road has a map marker you follow blindly for 7 hours and then it’s all over. The title of the New Vegas DLC chapter feels as if it was an honest review of the gameplay; battles are infrequent and impersonal, the landscapes are devoid of any interest or side quests and NPCs are completely missing. The main story follows the simple formula of fetch-quest-after-fetch-quest; the linearity is a worse offender than Dead Money. The designers also seem to have tried to make up for lack of content by ramping up the difficulty- Deathclaws aplenty with no possibility of sneaking within the tight backdrop. As there are no restrictions on what you can bring to the Divide, I found the technologically advanced weaponry of Big MT was more than enough to help me through, and picked up little of what I found. Some new weapons in the form of an upgradeable rocket launcher and a behemoth of a machine gun are interesting at first, but end up too heavy and impractical. And scavenging is uncalled for even if it was possible; there is simply too limited a number of open areas. Once again, this New Vegas DLCs major selling point was for the raise of the level cap by 5. Disappointing, dreary and full of loose ends, I rate this as the worst of the packs. Is Any New Vegas DLC Worth it? After ploughing so much time into both Fallout 3 and Fallout New Vegas, it’s depressing that I don’t think I will ever have this amount of time to sink into a game again. Yes the add-ons were mostly disappointing, and yes there was a serious lack of inspiration in some content, but I still played all of them to the end and would still feel obliged to continue if there were any future releases. Just on the hope that the next one would be THE game that would replicate the same breath-taking feeling of the first dip into in Fallout 3.